We've had Michael Collins' book sitting around the house for a year and a half and we're finally going to give it a go. Here's a picture of one of the finished guitars. Bearclaw spruce top with quilted maple left over from a previous build. Mahogany/maple laminate neck. Thanks to Michael G. Stewart for the fantastic photo. Above is a video of the new rosewood dreadnought documented on this page. Started off gluing together some necks. Decided to go with laminate construction for the necks figuring that I could control wood movement better by orienting the grain to balance movement tendency. We used various combinations of maple and mahogany. We made about six necks so we have plenty laying around for future projects. I used a very well written book to help with the Martin project. The book is by Jonathan Kinkead and is called "Build Your Own Acoustic Guitar." 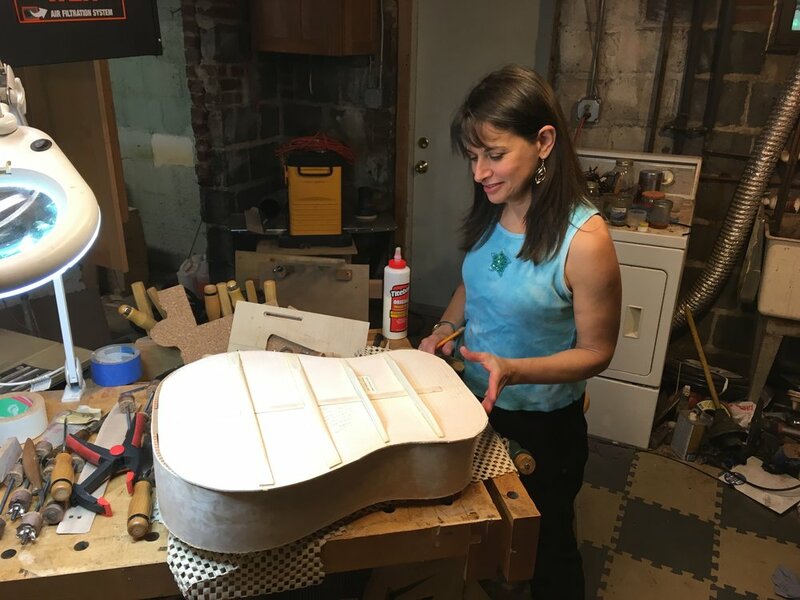 The book is straight forward and systematic for anyone with woodworking/luthier experience, plus he writes notes of encouragement after several of the operations to help keep your spirits up. Thank you, Mr. Kinkead for a very well-done book! I also used "Guitar Making Tradition and Technology" by William Cumpiano. Very comprehensive and detailed. I also referred to Bob Benedetto's archtop book for a few comparisons to the archtop guitar construction methods I was familiar with. The blueprint I used was from Stewmac and was for a Martin Herringbone Dreadnought. It is a very useful drawing and I'm glad I had it to refer to for measurements and profiles. The photo above is a picture of the mold under construction. The mold is based on Mr. Kinkead's mold and worked very well throughout the whole process. The two halves of the mold are clamped together to hold the entire body as it is built. Obviously I skipped a few steps here in the documenting process. This is how I attached the tailblock and neck block inside the mold. The rosewood sides were bent by hand on a bending iron. I was surprised how easily the rosewood bent, especially compared to the figured maple I have used for my previous guitars. I planed and scraped the sides down to about 2mm before I bent them. 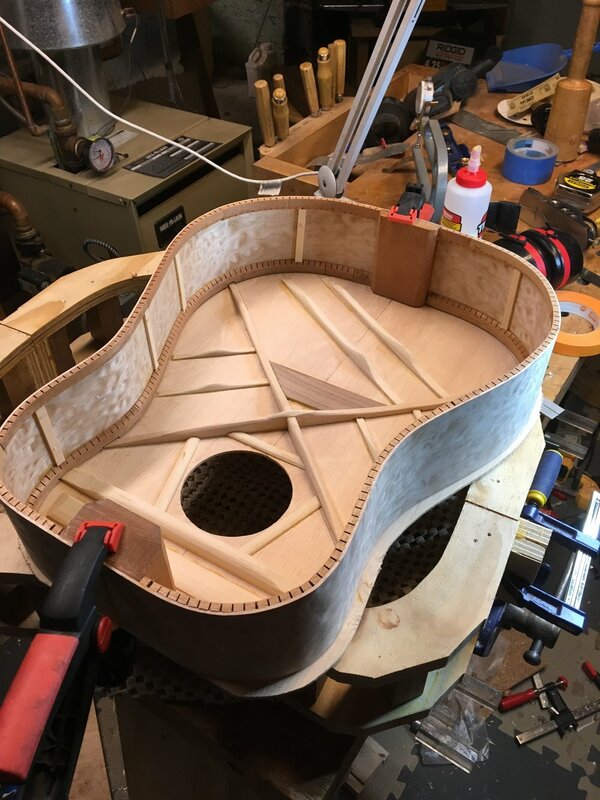 I find that it helps to plane them a little thinner in areas where tight bending is going to occur like on a Venetian cut-away. The dreadnought shape was far less stressful to me and the wood so I was able to keep the sides on the thicker side. As you can see in the photo, I used shims to add pressure to areas where there were gaps between sides and the blocks. I probably needed to refine the mold or the blocks a bit more. Oh well, maybe next time. Gluing in the linings. I liked Mr. Kinkead's expanders for the waist. You may notice in this picture that the body is shallower than the mold. The quilted maple sides I had available were not as deep as a standard dreadnought so this guitar ended up being about 3/4 inch shallower than a full dreadnought. Clearly this is not the rosewood seen in the previous photo. I made two guitars using the same mold, the first guitar is the maple one. I used this as a sort of prototype to test out methods before applying them to the rosewood. This picture shows the linings and the installation of the side braces. I chose to use wood side braces vs cloth reinforcement apparently used on some Martin guitars. By the way, on both these guitars I used Titebond for some applications and hide glue for others. Since rosewood is apparently less friendly to titebond, I used hide glue for most joints where rosewood was involved. I couldn't tell you if there was a difference in glue integrity, but the fast tack of hide glue was a plus, especially in applying bindings later on. As a side note, I cut these braces on the bandsaw and then shaped them by hand with a plane ala a violin soundbar. As I begin dreadnought number 3 in 2018, I have come to realize that an oscillating belt sander makes really quick work contouring the rough sawn braces. I laid out and cut the notches for the braces in the kerfed linings. Next time I will be more precise measuring the thickness of the braces and cutting the notches accordingly. I chose to use a wooden cap rather than glue soaked linen where the braces cross beneath the sound hole. Below I am gluing the top to the sides. There is a caul below the boards crossing the top to distribute pressure evenly along the edge of the top. This worked pretty well but I did have to reinforce the mold structure because the clamping force began to separate the plywood top frame from the spacer blocks (the blocks between the two plywood frames). The clothespins jutting out from the end were ad hoc wedges (in addition to some shims) to increase pressure over the neck and tail blocks where the clamping force was not as strong. After gluing on the top I trimmed the excess with a flush cut bit being very careful not to chip out the spruce. I kept the body in the mold for support and stability. Below is my very lovely wife along with the maple back complete with braces. Below is the process for gluing back to the body. I am using a bunch of homemade spool clamps. The spool clamps were made with very inexpensive carriage bolts and spools cut from Walnut scrap with a hole cutter on the drill press. I glued sheets of cork to the blocks of scrap and then mass produced spools. Not very stimulating work but saved a lot of money and really didn't take that long. The carriage bolts were very cheap but covered in grease so it was a messy. messy job. Had to be careful that the grease didn't get on to the maple or spruce. By the way, I forgot to mention that after sanding the top many steps ago, I applied a couple of thin coats of shellac to help keep the top from getting too dirty or stained during the construction process.